Shepherdstown, West Virginia, is a hidden enclave of art, shopping, recreation, and dining located in the eastern panhandle of a much-overlooked state. Just an hour and a half from Washington and Baltimore, tucked away on the banks of the Potomac River, this town of about four thousands residents hosts a liberal arts college, Shepherd University; the Contemporary American Theater Festival; and many small, locally owned boutiques and restaurants. The town relies heavily on tourism from DC, and access via the MARC train makes Shepherdstown one of the westernmost outposts of the metropolitan area. Visitors may draw aesthetic connections to Alexandria’s Old Town district, or even to Georgetown before the addition of modern retail chains, although Shepherdstown is much smaller. The town also offers free weekend parking, several choices for lodging, and various seasonal festivities. Among the choices for fine dining in the quaint, three-block downtown area is Bistro 112, a French-style restaurant in a beautifully maintained, nineteenth-century row house typical of the historic town. 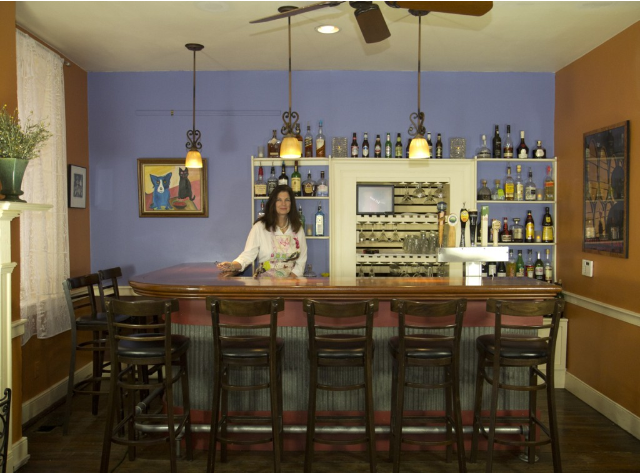 Bistro 112 is a cooperative endeavor between the owner, Deborah Tucker, and Chef Kelly Fitzgerald. Ms. Tucker fills the front rooms with French-inspired art, live local music, and a unique ambiance, while Chef Kelly fills the plates with affordable but decadent French-inspired cuisine. He is trained in cuisine minceur, a technique that recreates the intense flavors of traditional French cuisine while producing a lighter dish. 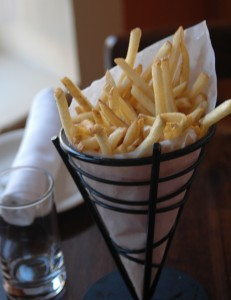 Food at Bistro 112 is cooked in smaller amounts, enhancing freshness and consistent flavor. Chef Kelly relies heavily on locally sourced meats and produce, bakes the oven-fresh baguettes and croissants in-house, and is always looking for new ways to combine ingredients for the freshest, richest flavors. The bar serves up original cocktails and old favorites and offers a wide range of local and imported beers. An expansive list features wines from France, Spain, Germany, Austria, South Africa, South America, Australia, and the United States, available by the glass or the bottle. A server can recommended parings for a truly epicurean experience. Lunch at Bistro 112 runs from noon to three in the afternoon Monday through Saturday, and, at $10-15 a plate, is affordable even on a tight budget. The French-pressed sandwiches are foodie favorites. Try the Parisian ($13) for a warm, indulgent mix of smoky, thin-sliced pork loin with brie and sun-dried tomato pesto—you may imagine yourself sitting in a cafe overlooking the Seine, chatting with Hemingway. The crêpe Lorraine ($12), a savory ham- and cheese-filled delight with cream and fresh herbs, will have you pining for the countryside and dreaming of Cezanne. Romantic idealism aside, the food speaks for itself. From 5:00 to 9:00 p.m., the mood at Bistro 112 changes with the menu. Dinner ($15-$30) is served Monday through Saturday, and the candlelit dining room is perfect for catching up with friends or beginning a romantic date night. The mussels ($16) are served in either a creamy garlic wine sauce or a sauce du jour. The appetizer is a favorite of first-timers and seasoned regulars alike, and is big enough to share with one or two friends—especially if you want to leave room for salad, entrées, and dessert (highly recommended). One of the best-loved salads offered at Bistro 112 is the house original, “beet it” ($10.50), featuring beets, apples, chèvre, candied walnuts, and mixed greens with balsamic vinaigrette. For a meal-sized salad, choose the Niçoise ($15.50), a fully loaded bowl of mixed greens, grilled medium-rare ahi tuna, hard-boiled egg, potatoes, string beans, tomatoes, capers, and olives, with house-made wasabi vinaigrette—a staff favorite as well. The entrées are similarly mouthwatering, and although you may find similar offerings elsewhere, they will never taste as flavorful or carefully prepared as they do at Bistro 112. The Moroccan duck ($28) is crispy but never dry, and served with a fig chutney that is sweet with just a hint of tartness. The spices mix with the fruity chutney in a way that seems to enhance each flavor separately. Roasted root vegetables and tuxedo orzo accompany the meal beautifully and add colorful visual appeal. One cannot pass over the grilled steak l’Entrecôte ($25), served au poivre in Bistro 112’s peppercorn sauce. A classic dish that exceeds all expectation, your tastebuds will appreciate the culinary stimulation. 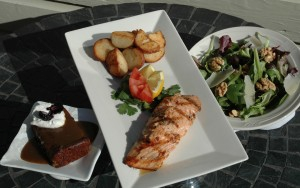 The prix fixe bistro menu offers three courses including a salad, choice of entree, and dessert for $25-$30. Sunday brunch at Bistro 112 is an experience for the mind and the mouth. Sitting in the sunlit front room in the early afternoon with an Illy espresso or cappuccino ($3.50; $4) feels like a trip to Europe before your food even arrives. Order the croque-monsieur ($10) if you are craving a wholly new take on the breakfast sandwich. The slices of house-made bistro bread topped with gruyère and ham and smothered in a creamy cheese sauce are toasted to achieve the perfect balance of weight with a light, crispy exterior. Three-egg omelettes ($10.50) can be prepared with mushrooms and fontina cheese or ham and gruyère and are served with roasted potatoes, toast, and jam. The combination may sound familiar, but it is truly something special. Eggs Benedict ($10) is a noteworthy option, topped with salmon and house-made Hollandaise sauce. The chef carefully renders these heavy breakfast dishes with a light touch that will not leave you lethargic for the rest of the day. 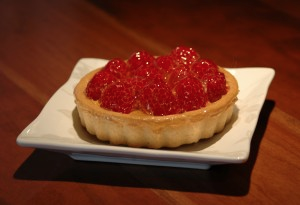 French cuisine is tried and true, with an old-world decadence and a traditional romanticism. At Bistro 112, owner Deb Tucker welcomes guests in a fashionable ruffled apron that hints of summers spent in a farmhouse in the South of France. The warm dining room glows with heat from the fireplace and candlelight reflects off of fresh flowers while soft music plays in the background. 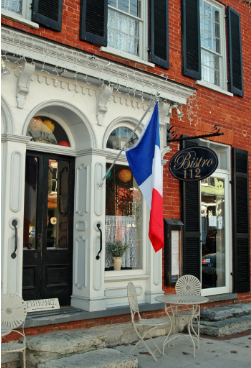 When your meal arrives, you will fully understand the mixture of tradition and le nouveau that makes Bistro 112 in Shepherdstown well worth the drive from DC.